CARMA stands for California Retirement Management Account. But we’re not talking about a retirement account for people. This retirement account is a fund for horses. Not just any horses, though; these are Thoroughbred racehorses. Thoroughbreds are true athletes. They are just like the human athletes sitting on top of them, the jockeys. Some of these horses have long, healthy careers. Some, though — just like any athlete — are injured and have to retire early. In either case, they invariably still have plenty of life to live and are in need of ways to do it in a fulfilling fashion. That’s where CARMA comes in. CARMA provides these magnificent four-legged athletes aid in finding fresh direction through retraining for new careers – as hunter/jumpers, trail horses, therapy horses, among other roles — or it allows them the opportunity to simply live out an extended life in comfort after their racing days are done. CARMA was founded by a conscientious woman who owned a racehorse named Lennyfromalibu, whom she bred and raced. The woman’s name is Madeline Auerbach. “Lenny” was a very good horse, running from 2002 to 2005, winning several stakes races and earning more than $400,000. When the time to hang up his racing plates arrived, though, a thought came into Auerbach’s mind that, unfortunately, wasn’t then entering the minds of all horse owners. Adopting a racehorse is not as simple as adopting a dog or cat from a shelter. These horses likely have to be retrained to be riding horses rather than racing ones. Not to mention the space, food and care they need. As mentioned, some have injuries that need medical care on the road to recovery. Some may never recover to the point where they can be used in a second-career way. But that doesn’t mean that they are simply discarded. CARMA began in 2007. Auerbach had quite a learning curve figuring out how she would fund this endeavor. Fortunately, the California Horse Racing Board (CHRB) was willing to work with her on it. Auerbach explained how CARMA functions. CARMA does an assessment on horses that need to be retired to ascertain what the best possible outcome for them might be. It has a placement program for horses ready to retire that have no other options available to them. Most of the horses they deal with are able to be retrained and ridden. However, even if a horse can only stand in a pasture, that’s quite all right with CARMA. The only measure that might cause a horse to be turned away is if the owners chose not to participate in contributing to the CARMA fund. “It doesn’t make sense if the owner has not contributed to CARMA. It has to be a partnership,” says Auerbach. Auerbach’s active involvement in rechanneling racehorses came about because of one marvelous animal she became involved with named Unusual Heat. The handsome son of the high-line stallion Nureyev arrived in her life via an $80,000 claim in 1996 by an extended partnership group that included her, her late husband James and trainer Barry Abrams. 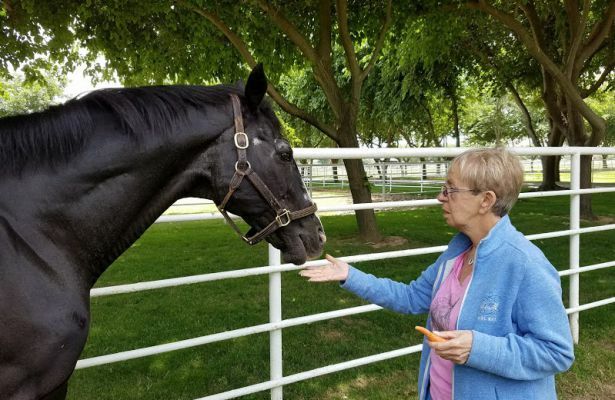 Two years later – when it was time for Unusual Heat the racehorse to retire – he had no problem finding another job. He went to the stallion shed and – over the next 19 years – became an absolute breeding star. By most yardsticks, in fact, he proved to be the most successful stallion in California history. Unfortunately, Unusual Heat passed away at Harris Ranch on May 17, 2017 at the ripe old age of 27. (More on the horse and his Auerbach connection can be found at www.auerbachracing.com) His legacy lives on, though, not only in the hundreds and hundreds of offspring he sired, but in the rescue umbrella that CARMA spreads across the California racing landscape. Since CARMA’s inception, the foundation has raised more than $5 million toward its cause. More than 3,000 horses have been aided in retraining, re-homing or retiring through the program. Auerbach’s role in horse rescue in the state continues on, driven by her passion for something she believes in strongly.